BELTON – The University of Mary Hardin-Baylor football team responded to Rowan’s opening drive touchdown with 35 first-half points and the Cru rolled to a 59-8 victory over the Profs in an NCAA Division III National Championships Second Round game Saturday in Belton. UMHB improves to 12-0 on the season and advances to the NCAA Quarterfinals for the fourth straight year with the victory. The loss ends Rowan’s season at 9-3. The Profs took the opening kickoff and marched 51 yards in eight plays before Withler Marcelin scored on a four-yard run just 3:43 into the game. UMHB blocked the extra point, leaving Rowan with a 6-0 lead. The Cru would answer on its second possession as Elijah Hudson scored on a seven-yard run to put UMHB up 7-6 with 3:28 left in the first quarter. Zach Anderson hit Wykeyhe Walker with a 41-yard scoring strike to push it to 14-6 UMHB with 53 seconds to go in the first. Michael Carpenter scored on a 13-yard pass from Anderson and a six-yard run to stretch the lead to 28-6. Rowan would then drive into the red zone before Cody Jones intercepted a pass and returned it 51 yards to set up Anderson’s six-yard scoring strike to Keith Reineke with 16 seconds remaining in the first half. Rowan blocked a UMHB punt early in the third quarter to cut the gap to 35-8, but Chad Peevey’s 23-yard field goal extended the lead to 38-8 at the end of the third period. A Cru punt skipped off the heel of Rowan return man Jared Sanchez early in the fourth quarter and Glen Gilliam pounced on it in the back of the end zone to give UMHB a 45-8 lead and Jones returned a punt 71 yards for another score to stretch the lead to 52-8. UMHB reserve quarterback Brian Gallagher closed out the scoring with a 37-yard touchdown scamper with 10:11 left to play. Hudson ran for 136 yards on 23 carries and moved into seventh-place on the Cru career rushing list. Anderson added 116 rushing yards and went 12-18 through the air for 168 yards and three touchdowns. Jones finished with ten tackles to go with his interception and punt return for a score. Silvio Diaz added two sacks for the UMHB defense. Khalil Pierce topped Rowan with 43 rushing yards on 15 carries and Marcelin ran for 41 on 19 attempts. Bill McCarty was 9-15 passing for 105 yards. Chris Alvarez led the Profs defense with 13 tackles and Tyler Jenkins added 12 stops. 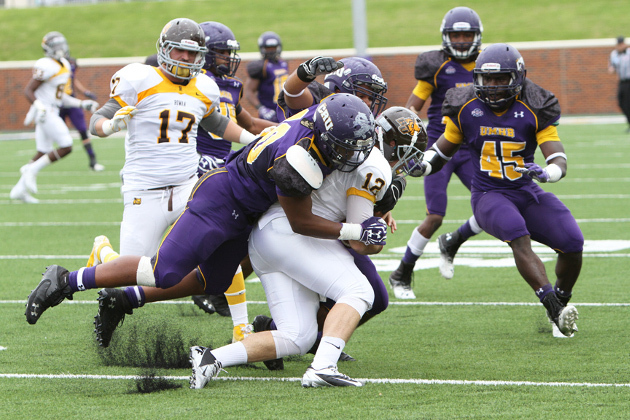 UMHB’s defense held the Profs to 209 yards of total offense on 63 plays and forced three turnovers. The Cru rolled up 337 rushing yards and finished with 525 yards of total offense while not giving the ball away in the win. UMHB will now face St. John Fisher in the NCAA Quarterfinals next Saturday. The site for that game will be announced on Sunday afternoon. The Cardinals are 10-2 on the season and advanced with a 27-6 victory over Hobart College on Saturday. This will be the first meeting between the two teams.